That Morris Family: MIA doing DIY =) classic! I have been totally MIA from what seems like everything! What have I been doing....well feels like nothing but that's not true ;) Almost completed the kids bathroom, decided to go with a Lego theme for the boys room a forever work in progress and attempting to fix up the bonus room which BTW houses a desk area, tv, futon for guests, toddler art table, and my sewing corner it's so difficult to cram all of that into ONE room and trying to make it flow has been mind boggling.....SO I decided to work on each corner at a time and hopefully if I keep a color scheme in mind it will all fall in place (one can hope!) 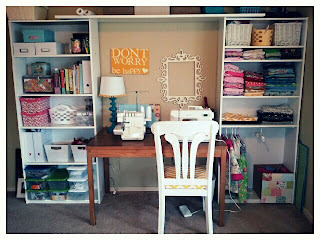 So here is a little taste of where the Magic happens for me....MY Sewing corner (which is ever growing) still not complete but work in progress and the new BONES are up =) also note I put together the right book shelf, yes the one that was put together properly.....my hubby put together the left one its minor but the very top piece is upside down :O tee hee! I squeezed the shelf's together on one unit and put in a tension rod to hang works in progress or done items. The chair is a yard sale score that's been floating around for a while it was originally forest GREEN with a lovely country plaid seat then it was black with a not so great cream linen seat( it was at the dining room table for a time...ewe is all I have to say!) now it's white with yellow CHEVRON! 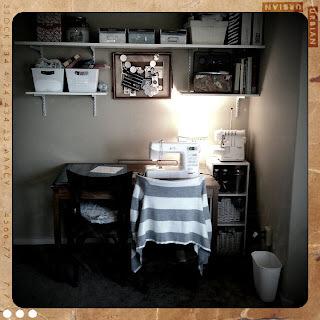 The whole faux built in cost under $100 bucks plus I have ample storage and room to cut and sew on! 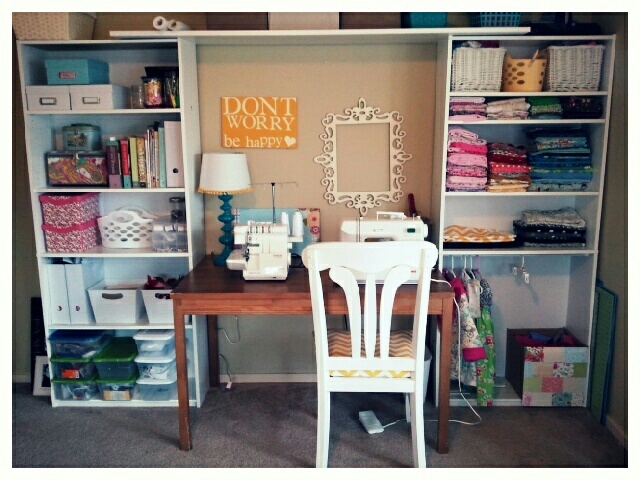 Still need to work on organizing, and getting some pics up or a cork board....hmm...so many ideas!